T&D distribute the full range of C Crimp Connectors that are specifically designed for copper tap and parallel connections of stranded copper cables in earthing applications. “C” type connectors available to achieve earthing connections on copper type cable conductors with cross-section areas (CSA) 10sqmm to 240sqmm – installed using appropriate ratchet, hydraulic or battery type crimping tools and associated die sets. A split bolt connector design manufactured from Gunmetal is available which negates the requirement for the earthing system installer to use crimping tools. ➡ Contact T&D for the complete range of copper earthing products including earth tapes, earth rods and earth bars, manufactured by AN Wallis. 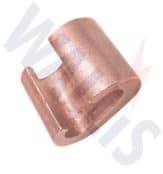 Should you require technical support to enable the correct selection and supply of copper connectors with “C” type design for crimping stranded copper earthing cables and conductors please do not hesitate to contact us. ➡ Contact T&D for competitive prices and fast delivery from stock for C’ Crimp Connectors.